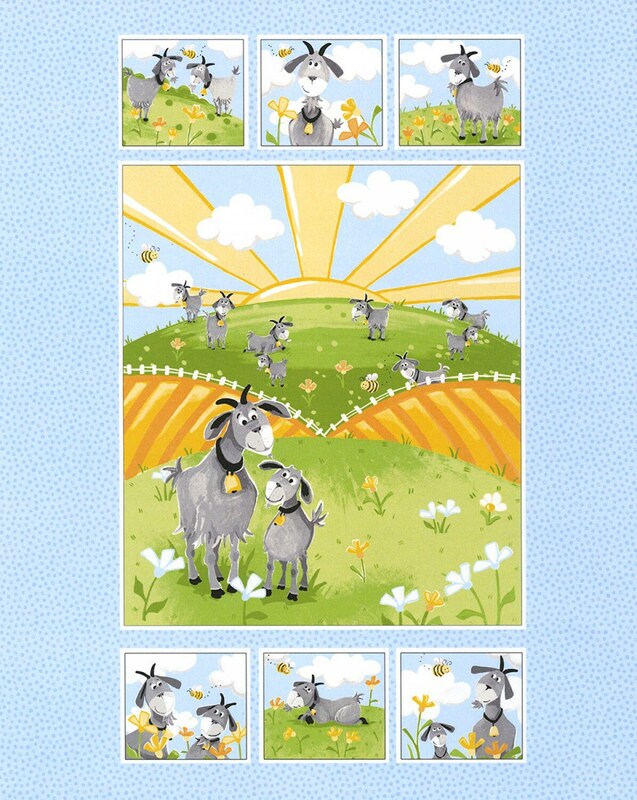 Susybee has created another delighted animal, Hildy The Goat Fabric Panel. What a wonderfully sweet addition to the other Susybee whimsical animals we already have in stock. You will find Hildy who is absolutely adorable enjoying the warm sunshine in a field of green with her friends. Little goats playing in a field of flowers with bees a buzzing and flowers blooming. Such sweet shades of blue, yellow, green, blue and orange dot this sweet panel. All fabric from The Quilted Nursery Fabric Store is cut directly from the bolt in continuous yardage unless otherwise specified. We also offer fractional yardage cuts for your shopping convenience. All fabric is shipped in 24 hours except for Sundays and holidays. Shipping overages are refunded upon shipment of fabric. So nice, I love it. Very fast shipping to Germany. I recommend this seller. Seller was very kind to combine sales. Cute panel of goats. Received the order so quickly. Now I need to get busy with my projects. Thank you so much.